Histidine is an essential amino acid with several interesting chemical properties. The imidazole ring of histidine can adopt several different charge states at typical cellular conditions, and it interacts strongly with metal ions. All of these properties are demonstrated in the enzyme imidazolonepropionase. This enzyme is one of the community-nominated targets studied by the New York SGX Research Center for Structural Genomics (NYSGXRC) as part of a larger study of enolase and amidohydrolase structural genomics. It performs the third step in the major pathway of histidine degradation, when a water molecule is used to open the histidine ring. Ironically, the active site relies on a constellation of histidine amino acids to perform the histidine-breaking reaction. The NYSGXRC has studied this enzyme at both the beginning and the end of its reaction. The enzyme from the Sargasso Sea bacterium was solved with an analogue of the substrate, and the similar Agrobacterium enzyme was solved with the product of the reaction. The structures reveal the atomic details of the active site and have revealed many aspects of the reaction mechanism. The active site is centered around an iron ion which is coordinated by a collection of histidine and acidic amino acids. Two additional histidine amino acids and a glutamine perform the hydrogen-shuttling operations in the hydrolysis reaction. Both of these complexes are shown close up in the Jmol images below. Two structures capture HutI at the beginning and the end of its reaction. 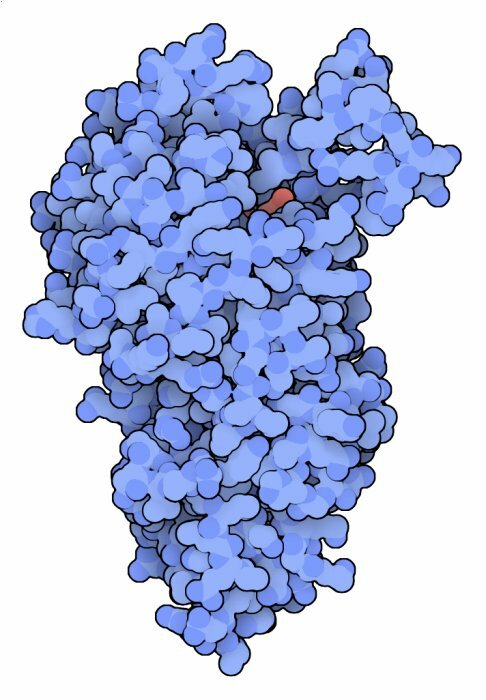 This Jmol image shows a close-up of the active site and you can switch between the two structures using the buttons below. PDB entry 2q09 is bound to an analogue of the substrate. A water molecule (large turquoise sphere) is positioned over the ring in the substrate. An iron ion (brown sphere) activates the water. Two histidines and a glutamine (in green) assist in the dehydration reaction, and three histidines and an aspartate (in yellow) coordinate the iron atom. PDB entry 2puz has the product bound in the active site, after the ring has been opened. Tyagi R, Eswaramoorthy S, Burley SK, Raushel FM, Swaminathan S. (2008) A common catalytic mechanism for proteins of the HutI family. Biochemistry 47, 5608-5615. Tyagi R, Kumaran D, Burley SK, Swaminathan S. (2007) X-ray structure of imidazolonepropionase from Agrobacterium tumefaciens at 1.87 A resolution. Proteins 15, 652-658. Venter JC, Remington K, Heidelberg JF, Halpern AL, Rusch D, Eisen JA, Wu D, Paulsen I, Nelson KE, Nelson W, Fouts DE, Levy S, Knap AH, Lomas MW, Nealson K, White O, Peterson J, Hoffman J, Parsons R, Baden-Tillson H, Pfannkoch C, Rogers YH, Smith HO. (2004) Environmental genome shotgun sequences of the Sargasso Sea. Science 304, 66-70.